I loathe Big Brother. I hate that it's so popular. I wouldn't mind if the audience demographic consisted solely of mindless idiots, who would otherwise be "out with their m8s havin a larf" before going home to watch (and probably enact) Armageddon. What astounds me is how many supposedly intelligent people also watch it. They even talk about it at work, as if it really matters. Some of these people are my friends! This is a program that makes human life itself another cheap commodity. A program that perpetuates the insidious notion that privacy is not only to be ignored but something of which we should be suspicious. The sole "entertainment" is in watching a group of useless people in anticipation of an argument. It's the equivalent of that schoolyard phenomenon where children gather around to watch a couple of their peers batter each other senseless. To add insult the program makers like to suggest we're witnessing some kind of social experiment. To do so insults the intelligence of any sane person, though not it would appear that of the viewers. Why is she wearing a moustache? 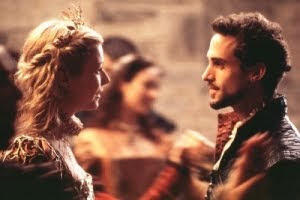 This was the first question my daughter asked upon coming into the living room to find me watching Shakespeare In Love. Not bad, and considering that somehow none of the characters in the film had yet figured out she was "in disguise", pretty perceptive for a five year old. Daughter: "Are they going to get married?" Me (non-committal): "They might do.."
Daughter: "But they are kissing a lot." Me: "Yes that's true, but I think she might have to marry someone else." Me: "Because in those days some people were told who they had to marry." Me (already getting desperate): "That's just the way it was." 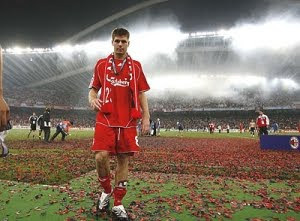 After watching Liverpool FC lose the Champions League final last night I reflected that they had at least made a game of it and done themselves proud. At times like these I believe it's perfectly acceptable to indulge in a little clichéd football talk. Actually when it comes to football it seems any time is O.K. The other week for instance I was discussing the merits of Garcia with a Spanish colleague of mine and mentioned, without the slightest hint of embarrassment, that the "trouble with Garcia is he does blow hot and cold". My English isn't the best but when it comes to football my brain does seem to take a vacation for the duration. I remember one meeting with admin (rumour has it work is more important than football) the day before a crunch match where my mind went wandering; only to be brought back to the real world when the manager said "what do you think Phil?". Fair play (there I go again) I did manage to side step the question brilliantly with a "hmm..." and a slight shrug which seemed to do the trick. All of which rather detracts from the main point that terms such as "gave a good account of themselves" and "they did well to get that far" are apparently, my football loving brethren inform me, "loser talk". It turns out I'm not showing a level of maturity or perspective at all. There I am worried that I may be getting a little slower (a lot slower if my recent football performances are anything to go by) and, dare I say it, old, and it turns out that all I am is a "loser". If you'll forgive one last cliché... result! Should I wait until I have something that may be of vague interest to say or, given how long I'd have to wait for that to happen, just write any old thing that comes into my head? Trouble is, I find other people's lives far more interesting than my own. Either that or I'm just nosey. 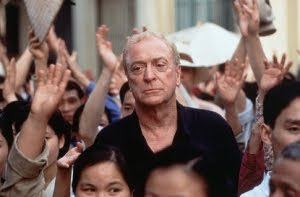 Think I'll try and adopt the Michael Caine approach. Hopefully there'll be the odd The Quiet American alongside The Swarm, Jaws: The Revenge and numerous other aberrations.